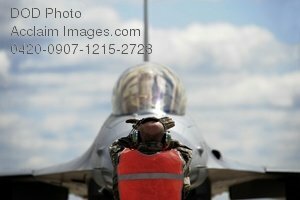 Description: Free, public domain image: Flight Crew Airman Directing a F-16 Fighting Falcon Jet. Master Sgt. Jeff Knoll, an F-16 Fighting Falcon crew chief assigned to the South Dakota Air National Guard's 114th Fighter Wing in Sioux Falls, marshals an F-16 Fighting Falcon June 4 during Exercise Maple Flag 42 at Cold Lake, Canada. (U.S. Air Force photo/Senior Airman Larry E. Reid Jr..